Teams Integration – Welcome! How can we help? Microsoft Teams is a complete chat and online meetings solution. With Microsoft Teams you can host audio and/or video and perform or attend online conferences. It also lets you communicate with other members of your organization, or even people outside your organization, through an intuitive chat feature. This provides the users with a unique intuitive interface from which all the necessary features required for team work on various projects can be accessed. By using automatic integration between Microsoft Teams and WorkPoint through Office 365 Groups, documents created, uploaded or edited are stored in the same location, regardless of whether the user is working through the Microsoft Teams interface, or through the WorkPoint/WorkPoint Express interface. One use case could be instances where a specific project team wants to use Microsoft Teams to organize and work with their project. Perhaps because they are used to the Teams interface, or for some other reason. Additionally, Microsoft Teams is integrated with Microsoft’s online office suite Office 365. This means that it is tied together with other apps such as Word as Excel, as well as cloud storage and services such as SharePoint, PowerPoint, OneNote, Planner, Power BI and Delve. As a consequence of this, any document, presentation, and spreadsheet shared within a Team are automatically synced with a copy stored in Microsoft’s OneDrive cloud storage as well as a local SharePoint environment. This makes it easier to keep track of all of the Team’s shared documents, and to not miss any updates, both in communication and in documents. Microsoft Teams also has the capability to connect to outside services such as GitHub, Zendesk, Evernote, and SAP SuccessFactors. It can even connect to businesses' own internal apps through an API. Access to files, internal sites and dashboards is controlled by Office 365 Groups and SharePoint. Users can create a new Group or attach the Team to an already existing one when creating the Team. Security-wise Teams meet all the same security standards as Office 365 and is Office 365 Tier C compliant. The service enforces two-factor authentication, single sign on through Active Directory, and encryption of data in transit and at rest. It is possible to activate integration to Microsoft Teams in WorkPoint. The integration links entities to Microsoft Teams through Office 365 Groups. On each individual business module Office 365 Groups can be activated, given the use of the one-site architecture with the one-site-pr-entity option. Once an entity has been connected to an Office 365 Group, a Microsoft Teams site is automatically created for that entity. 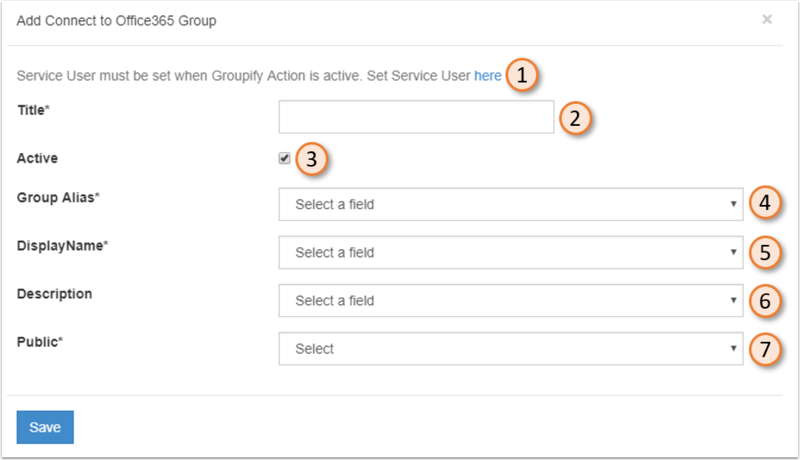 When activated, WorkPoint can automatically make sure that an Office 365 Group is created for each entity, which is linked to the site collection that WorkPoint set up. It Is, however, optional whether WorkPoint should create an Office 365 Group for each entity. This means that for e.g. a Projects module it is possible for some entities to have Team/Office 365 Group integration, while others function as normal in WorkPoint. It is also possible to make the creation of the Office 365 Group happen when certain conditions are met. An example would be that the Office 365 Group should not be created until a Project reaches the “Active” stage. All these functions can be done through Action Management. If setting up the connection via Action Management, a license to that feature is required. Furthermore, Teams integration is an additional feature that is not standard with WorkPoint. If your organization would like this feature, please contact WorkPoint Sales at sales@workpoint.dk. Connecting a WorkPoint business module entity to an Office 365 Group is primarily done through the Action Management in WorkPoint. Generally, an action is set up to establish the connection, and this action can then be triggered in various ways. It can either be triggered manually, or dynamically based on entity data. If dynamic, establishing connection can be made conditional based on data. Through the Action Management settings for a given module, an Action of type “Connect to Office365 Group” can be added. A Service User must be set when Groupify Action is active. You can click the “here” link to go to the setup for Service User. This service user must be able to create and read groups, and it must also be able to read users. The title field holds the title of the action. The action can either be active or non-active and can be toggled using the checker. A column can be selected for WorkPoint to pull data from for the Group Alias. Note that only columns of type “Single line of text” are allowed. A column can be selected for WorkPoint to pull data from for the DisplayName. Note that only columns of type “Single line of text” are allowed. A column can be selected for WorkPoint to pull data from for the Description. Note that only columns of type “Single line of text” are allowed. A group can be set to either be Private or Public. The state is selected from the drop-down menu. Note that a state of “Yes” means that the group is Public, while a state of “No” means that the group is Private. Private: When a group is private, only approved members in the organization can see what is inside the group. Public: When a group is public, all members of the organization can see what is inside the group. The privacy state can also be pulled from a site column as shown in the image below. Note that only columns of type yes/no-choice are allowed. The fields under Dynamic called “Confidential” and “GDPR” are columns of type Yes/no-choice on the module that is currently being worked on. Using a dynamic value means that, should the value change, so does the privacy state of the group. Note that custom yes/no-choice fields on the entity are also available - the "Confidential" and "GDPR" fields are examples. This action can now be set up to be executed via button in the My Tools menu of the solution, or automatically upon a specified event, such as a stage change. In this example, we will create an action to connect Project entities to Office 365 Groups, as well as a manual trigger for the action. We will also configure a My Tools button for the trigger, so that an end user can opt to connect his/her project to an Office 365 Group by themselves. 1. We have navigated to the Action Management settings for a Projects business module. 2. We have clicked the "Add Connect to Office 365 Group" button. 3-8 Relevant columns for information matching the fields have been filled out. 9. We click the Save-button. We are in the Action Management dashboard. We click the “Add Manual Trigger” button. We give the trigger a title. We set the permission required for this trigger. We select the Action we want to trigger. We click “Add” to add the Action to the list of actions to be triggered. We are in the My Tools dashboard. The Projects business module is selected. In the list of buttons and button groups, the Actions group is selected. We click “Add button” in the side menu. The title of the My Tools button is typed in. A fitting icon is chosen. A type of Manual Trigger is chosen. As Manual Trigger is chosen, we can choose the trigger we created earlier, called “Connect to Office 365 Group”. Open the Home menu and at the bottom, click “Need help?”. Click “Clear WorkPoint 365 Browser Cache”. By clicking “Go to Teams”, the user can access the Teams Site for the project. It is possible in the WorkPoint security system to make security rules which target Office 365 Group membership specifically. This means that “owner” and “member” of the Office 365 Group can be fetched from attributes of the entity in WorkPoint (e.g. Project Manager or Project Team). This has been made possible through the addition of new scopes on new security rules on relevant modules where the Office 365 Group feature is activated (shown below). Should an entity not be linked with a group, the security rules of groups are ignored. You can read more about the setup and configuration of the WorkPoint security system here.